Keshco, the quirky English trio of home-recorders, are delighted to bring more odd sounds and catchy melodies to WM Recordings. 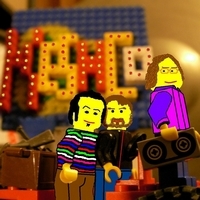 The six tracks on their new release “Lego Of Me” are about fantastical romantic visions – quixotic pursuit of love, obsession, inner peace through gender reassignment, futuristic old-fashioned entertainment, suburban sensuality, and ultimately, a honey-sweet afterlife where your favourite celebrities banter and put their harps through echo pedals. see more of our collections and choose the handbag to match your cocktail dress, the clutch to match your prom dress or the luggage to go on that trip! Download Lego Of Me here.